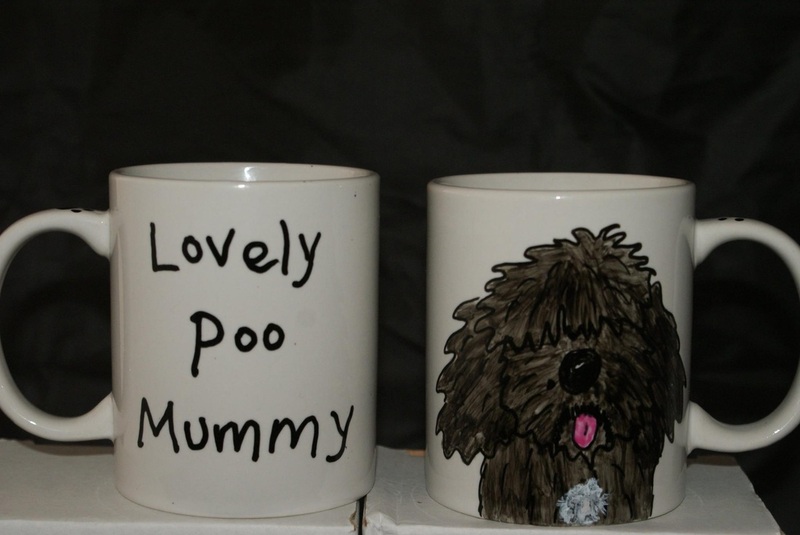 We have continued to raise money for Hearing Dogs, but now also have raised money for Cancer Research UK and a one off fund raiser in March 2015 for Support Dogs. 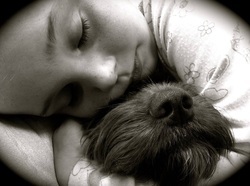 Feb 2014 : We held a Valentines Day Photo comp on clubs facebook page to win a lovely etched glass of your dog kindly donated by club member Debra Blackburn. 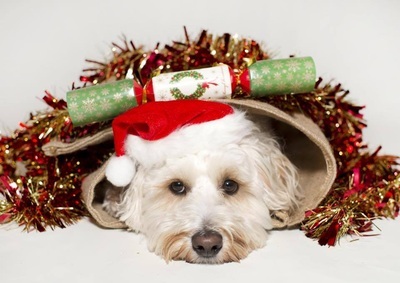 Raising £97.00 which has gone directly to our charity Hearing Dogs. The judges Debra and John Donnelly had a hard time choosing but the winner was Gillian Monk with her picture of her daughter with her poo Keeva. As the judges found it hard they awarded 2nd and 3rd Places where the prize is money off an etched glass to Shirley Fearnley and Mandy McIrvine. 3rd Place Pyper and her son Fergus. 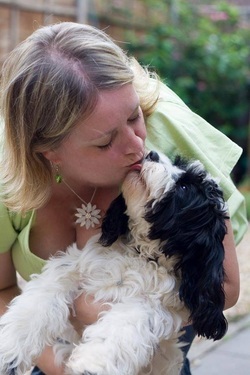 Gillian now has her lovely prize of a glass engraving of her cockapoo Keeva. We held a club walk on 13th April at Combe Park in Coventry which we nicknamed the Midlands Massive. We had 127 cockapoos attend! We had some members from Hearing Dogs For Deaf People attend as well as some of the club members who have hearing dogs and the event raised £323.57 via Hearing Dogs people collecting on the day. Thank you to all. The winning name was Tulip and the winner was Gillian Monk. It raised £81. Thanks to all who participated . 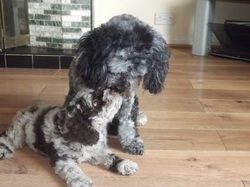 Money has gone directly to Hearing Dogs For Deaf people via our Just Giving Page. April 2014 : One of our club member s kindly donated a collar who wishes to remain anon and we did a quickie fun auction and raised £55. 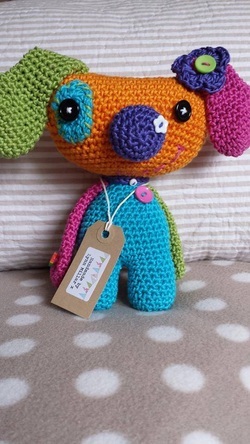 Sadly it didn't fit the recipient, so they kindly said to auction again and another £10 was raised making £65.00 in total. 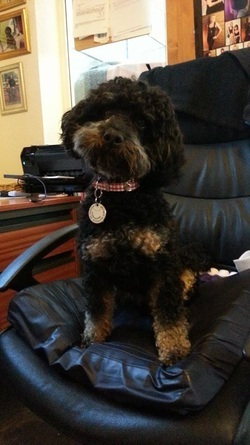 Here is Truff the proud owner wearing the collar. 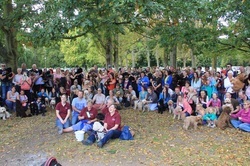 Sept 2014: We held another Midlands Massive walk at Coombe Park in Leicester on 21st Sept. Not only were there 169 cockapoos in attendance, but we held a raffle with prizes kindly donated. The raffle raised £417. Total raised on the day £591.33. Thank you to every one who donated and attended the event. 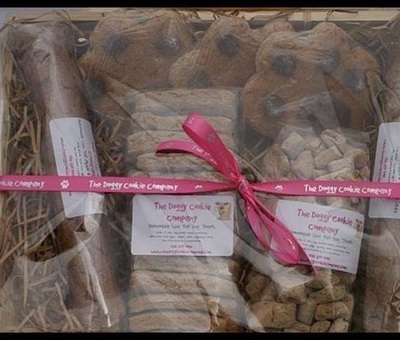 Club dog bandanas and treat bagscurrently being sold, donation will be made for each one sold, donations made by supplier Rebecca via our Justgiving page, for the charities the club is fundraising for. Thank you to all who took part it was great to see , lovely pictures and lots of support for each other. We raised £391 pounds!! 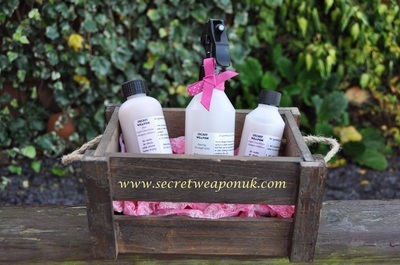 plus for those who did the free Gift Aid a further £67 making it £458 in total. Fantastic..and a great step to our target for Cancer Research UK. 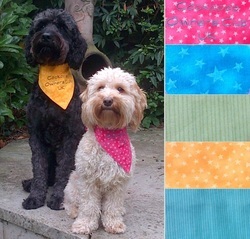 Charity bandanas for dogs, made by club member Rachel Ramshaw. Donation for each one sold being donated to clubs Just Giving pages for the charities we fundraise for. Oct 2014: Thank you very much to all the members who purchased a club calendar/s ...the amount we raised for Cancer Research was £1, 936.34, a wonderful amount ! We hope you enjoy using them next year. Nov 2014: We held a photo comp with the theme "celebrations" to coincide with the clubs 3rd year anniversary raising £129 excluding gift aid for Cancer Research UK. We had as an extra special prize of a mug from donated by team Wendy and Shirley. 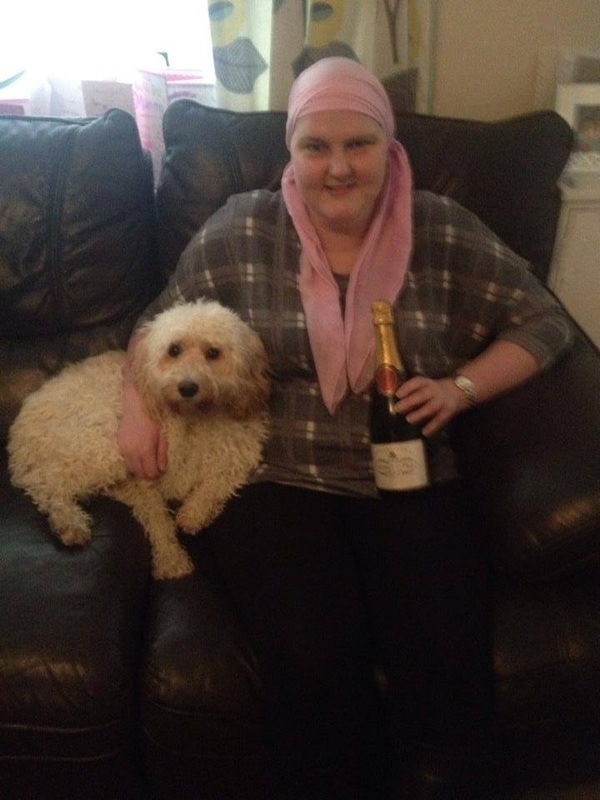 We all felt that this picture sums up what the competition is all about and we want to join in the celebration with JANE ROSSINGTON on her daughter getting the all clear from cancer. Xmas Charity Cookie Auction for Cancer Research UK. Cookies kindly donated by club member Chris from Doggie Cookie Company and postage paid for by team member Wendy. 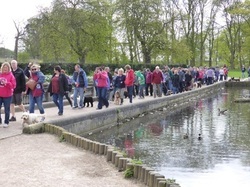 Jan 2015: Well done to all who attended the Kingsburys walk arranged by club member Mark Quinney on Sunday , 90 people attended and £127.90 was raised for Hearing Dogs For Deaf People. March 2015 : £94 was raised with our Mucky Pups photo comp for Support dogs, which was judged by the team from the Internet Gardner company, who also kindly donated the prize of a pair of Muck Boots. The winner was Debbie Stuart with her 'poo wallowing in this muddle puddle aka "hippopoo". 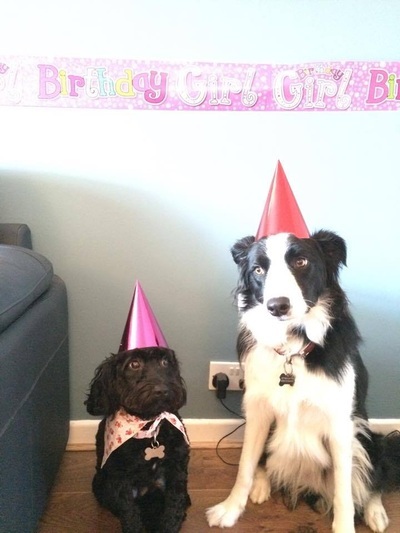 March 2015 : £120 raised through the selling of unwanted dog items on the clubs facebook selling page. This makes our total for Support dogs raised £214. We are registered founder members of the Assistance Dogs UK governing body and Assistance Dogs International. Support Dogs receives no government funding and relies on donations and fundraising to continue our work transforming lives. 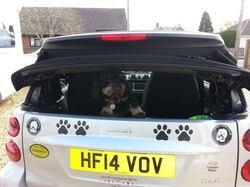 Our registered charity number is 1088281"
May 2015 : Congratulations to everyone that attended the Cockapoo Owners Club UK Midlands Massive. 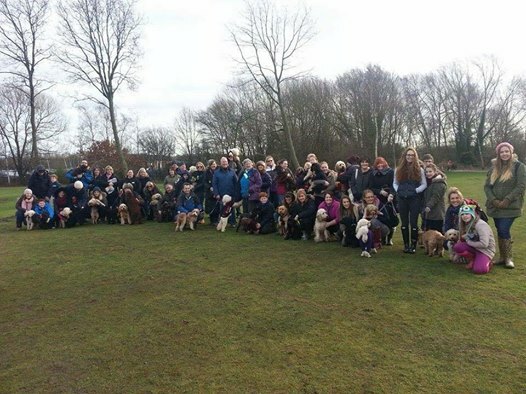 It was attended by 140 Cockapoos and you all managed to raise an amazing £338.63 for Hearing Dogs for Deaf People. Sept 2015: Your raffle ticket purchases and donations raised a wonderful £330.28 at the Midland Massive walk for Hearing Dogs For Deaf People. Well Done everyone. 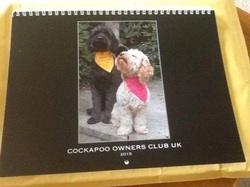 Nov 2015 : We did another popular club calendar raising £3,502.73 For Cancer Research UK. Thank you to everyone who has supported, donated and helped to reach these fantastic amounts. £5, 000 to be able to name our very own cockapoo to be trained as a hearing dog which we did and he was named Harley and is now a Hearing dog. To date we have now raised £11, 221.31 plus gift aid of £1,374.42 making grand total of £ 12,595.93.